The Medion Erazer X7311 D utilizes the the latest in Core i7 CPUs, but do you really need one? Spend more on a better Core i7 machine, or spend the same amount on a better Core 2 machine. Core i7 has climbed down from its lofty perch, as noble processors are want to do, to mingle with us common folk on the ground, and has made it's way into products like the Medion Erazer X7311 D.
And lo, we behold it in all its splendour, and proclaim: "You're not quite as impressive without other good hardware backing you up, are you?" And forsooth, verily, it is not. This was always going to be a concern. So far our Core i7 experience has mostly been a luxurious one filled with doublewide graphics cards and absurd quantities of flying pixels battering our faces with ludicrous gaming potential. Not so here. Medion's explosion into the world of gaming PCs is sadly squibby at best – cutting corners to push a price point down isn't a good idea. Medion has made a stab at prettifying the Erazer, with a couple of blue cold cathode tubes illuminating its guts and a perspex window so you can gaze at its insides. But if your Erazer is anything like ours, it won't be much to look at; you don't get attention to detail at this price. A couple of cable ties and some odd engineering is about the extent of it. Our case was particularly rickety, too. The fascia didn't seem to fit properly and the power button was utterly broken. The graphics card is the biggest corner cut. 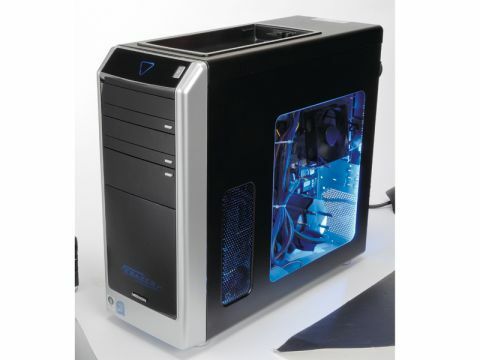 It's a passively cooled 9600GT – an oddly subdued card for a supposed gaming rig – with a standard fan bolted on to the heatsink at an awkward angle, pretty much abutting the window of the case. Quite what this fan is supposed to be doing in terms of airflow had us baffled – perhaps it's there to remind you to replace the card as soon as possible. At lower resolutions it naturally fares pretty well, but you're not going to be driving any 30-inch screens with this – the upper echelons of 2,560 x 1,600 are reachable but far from usable, a pretty sad state of affairs for a supposed next-gen gaming machine. At least it's something to build upon. With a terabyte of hard disk space, a highly respectable Core i7 920 on board and 6GB of triple-channel RAM, the Erazer is a powerhouse everywhere else. If you're thinking of working with video it's a very decent choice. Even the graphics card redeems itself a little with its HDMI port, meaning it's perfectly suitable for living room use. You could roll up your sleeves, upgrade the graphics and add a TV tuner, and tidy up after Medion, but should you have to? Why buy a Core i7 PC if you know you're going to have to upgrade it instantly? In fact, why buy a Core i7 right now? You can get better gaming performance by opting for a Core 2 with a heftier graphics card.